We were up bright and early on the morning of the 23rd of May, our day nine of our trip across our wonderful country, Canada. We just can't get enough! We had some wet and rainy weather as we headed towards Sudbury, Ontario, the largest city in Northern Ontario. Construction along the way around Sudbury, Ontario. Sudbury is also the only city in Ontario that has two official names. The second name being Grand-Sudbury. Sudbury has gone through a few booms and busts. Known for its nickel mining and production, the city boomed during the 1st and 2nd World Wars. Sudbury has the most lakes of any city in Canada within its boundaries, 330 in total. We camped at one of those campgrounds that..... how should we say it, it is not really on the top of our lists. Anyhow, no problems getting up in the morning (not sure if we slept), the trucks on the highway shook us out of bed. Ottawa was next on the list and the weather was warming up. By the time we arrived in the Capital City the outside temperature read 25°C on the truck console. We are smiling and soon arrived at Ottawa's Municipal Campground. Great place to stay. See map . Liz and Anders overlooking the Ottawa River. We checked in for three nights. The campground is wooded and lots of room between the sites. The sites could use some gravel, it does get a bit muddy when it rains (we had rain during our last night there). You can take a boat tour on the river. Ottawa the Capital of Canada is the second largest city in Ontario, behind Toronto. The city of Ottawa is connected by several bridges to its Quebec neighbour on the shores of the Ottawa River — the city of Gatineau. Gatineau use to be called Hull. Drive on the Parkway along the river. Ottawa is a really picturesque city. The Ottawa River gets most of its water from lake Timiskaming. 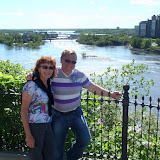 The river flows southeast to Ottawa and Gatineau, where it tumbles over the Chaudière Falls and further takes in the Rideau and Gatineau rivers. For most of its way it is the dividing border between Ontario and Quebec. We spent a day shopping at the Byward Market, here you can pick up just about anything, from groceries to art. The many ethnic foods that are available are tempting to say the least. If you are visiting Ottawa, this is a must. We also strolled around the Federal Parliament Buildings on Parliament Hill or "The Hill". This is where our tax dollar is at work..... sort of. Since 2002 they have been doing a 1 billion dollar restoration of the Gothic Revival or Victorian Gothic buildings. The predictions are the work to be finished by 2020. I have a feeling the price tag will increase. Another must see attraction in Ottawa: the Museum of Civilization is home to many different exhibitions, IMax theater, children exhibitions, educational programs and much more. We spent about four hours there and could have spent even more time. You just have to go and visit if you are in town. When you visit Ottawa you have to allocate some time to go across the river to Gatineau, Quebec (use to be called Hull). Here you get the taste of the French culture with some good food and drink. Liz in Gatineau people watching. In Ottawa, we visited and had lunch with some friends, Helga and Enrique.... Thanks for lunch, it was great to reconnect. After three nights of camping in Ottawa it was time to hit the road again. In pouring rain we set out on the morning of the 26th of May. The morning traffic through Ottawa was very heavy, but once we came to Montreal, the Ottawa traffic started to look good. We drove on the south side of the St Lawrence River, driving Route 20 up to Riviere-du-Loup. Parts of this drive is very scenic with some wonderful small towns with beautiful character homes. The stretch from Montmagny to Riviere-du-Loup is especially scenic and quaint. Route 20 is in many ways geared toward the people that like to pedal their bikes. It you are a cyclist, this route has to be on your bucket list. Lots of B and B's and interesting places to stay. Wonderful places to stay along the route. We arrived early evening in Riviere-du-Loup and camped at Camping du Quai with views out to the St Lawrence River. The Saint Lawrence River originates in Lake Ontario between Kingston, Ontario and Cape Vincent, New York. From there on, it passes by or through Gananoque, Brockville, Ogdensburg, Massena, Cornwall, Montreal, Trois-Rivières, and Quebec City. At this point the river starts to become tidal before draining into the Gulf of Saint Lawrence. We witnessed the tidal action one winter (March 2009) when we visited our daughter Linda in Quebec City while she was attending Laval University. We could see the ice clusters on the river floating up stream.... pretty cool. If of interest here are some pictures from March 2009 and Quebec City. The St Lawrence River is one of the largest estuaries in the world. The estuary portion begins at the eastern tip of Île d'Orléans, just downriver from Quebec City. The masses of water that flows through this river is hard to imagine unless you put it into numbers: where the Saguenay River flows into the St Lawrence River (see map), the outflow of water is 16,800 cubic meters per second or 16,800,000 liters per second. After a good nights sleep in Riviere-du-Loup we were ready to head for the province of New Brunswick. More pictures in our Picasa Web Album, below. More great photos!This part is more "civilization" than previous parts of your trip. The Ottawa area looks interesting and full of stuff to enjoy. Yeah Quebec and its food!!! I'm sure driving your 'hotel on wheels' was not as easy as it looks in that heavy traffic. I've chosen which B & B would suit me to a T.
We have driven through a lot of the places you have passed and our memories of this beautiful country are being sharpened up by your photos and descriptions. No water shortage here!